I am a firm believer that every child needs to be read to on a daily basis. I am such a fanatic about it, that my daughter is in two monthly delivery book clubs and has two large bookcases bursting with books! And she’s only 5. When I saw an opportunity to discover a new author and read some amazing children’s books in exchange for my honest and unbiased opinion I had to check it out. 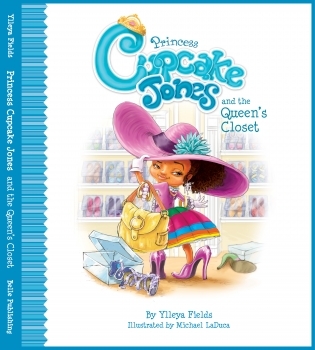 Princess Cupcakes Jones is written by Ylleya Fields and illustrated by Michael LaDuca. Both are crazy talented. Yllenya is a mother to three daughters and a son. She started writing because when she was reading to her eldest she had a hard time finding books with characters that looked like them, African American. She decided to change that. Yllenya has written three Princess Cupcake Jones books so far and each one is entertaining, comical and educational. I really love how she takes a lesson (like cleaning your room) and turns it into a funny and engaging story. The illustrations are remarkable and draw you into the story. The most recent published is Princess Cupcake Jones and the Queen’s Closet. It just arrived on bookshelves this month! And as the title suggest, young Jones plays in the Queen’s closet. Just as we’ve all done growing up, the best place to play is in your mom’s closet trying on all her shoes. (and sometimes makeup too!) As Princess Cupcake Jones is trying on her mom’s shoes, trying to get to a blue box at the top of the closet, she remembers all the stories her mother told her about each pair. But Cupcake Jones was so consumed by trying on the shoes, remembering what her mom had told her about each shoe, she didn’t realize what a mess and trap they were becoming. She became scared and yelled for her mom as she tried to climb over the boxes of shoes. Every time she tried to climb over the mound of boxes she fell back down. The Queen heard the cries for help and found the Princess surrounded. She lifted Cupcake Jones up and over the mess. Once Princess Cupcake Jones was safe from the boxes she remembered the one blue box she really wanted to see. The Queen brought it down and showed her it was her baby shoes. Princess Cupcake Jones had to try them on and see if they still fit. But they didn’t. She could barely get her big toe in them! So she asked her mother why they were keeping them.That’s when the Queen explained they were once her shoes when she was a baby and she had saved them for Princess Cupcake Jones to wear when she was a baby. And now they were saving them for Princess Cupcake Jones’s daughter to wear one day in the future! As a mom I found that incredibly touching. I really enjoyed Princess Cupcake Jones and the Queen’s Closet and so did my daughter. The story line was exactly what every child does, plays dress up in their parent’s closets. I received the Princess Cupcake Jones collection complimentary for evaluation purposes. Regardless, all opinions expressed are still 100% my own. I am disclosing this in accordance with Federal Trade Commission 16 CFR, Part 255 Guides Concerning the Use of Endorsement and Testimonials in Advertising.